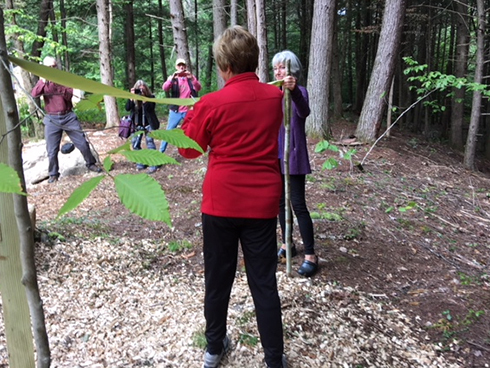 With a snip of the ribbon by Edna Radford on Sunday September 9, 2018, the new Radford-Smith Trail, that leads from WHPA’s ridgeline Cascade Trail down the hill and across the stream to Grassy Brook Road in Brookline, was opened to the public. Over thirty people attended the opening, and many chose to hike the new trail after the ceremony. Terry and Edna Radford bracket the new trail kiosk created by Andy Toepfer. 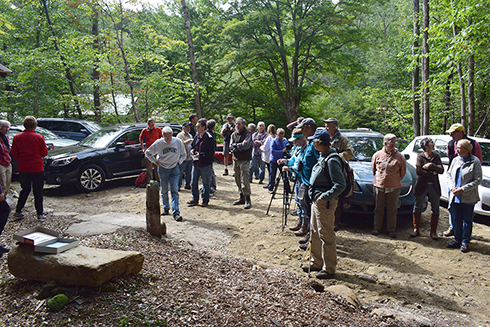 That short ceremony culminated a great deal of planning, engineering, and volunteer effort that started in 2017 when Terry and Edna Radford of Atlanta, GA, gave 55 acres of land to WHPA to expand WHPA’s protected holdings and to make the new trail possible. 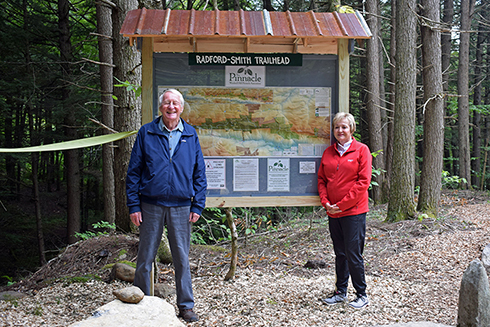 In addition to their land gift, the Radfords funded a unique footbridge created by master carpenter Phil Pellerin, who renovated the cabin at the Pinnacle overlook in Westminster, and a parking area. Sam Bourne of Sam Bourne Landscaping and Excavating in Brookline donated his expertise and machinery to create that parking area in order to make the trail more accessible to hikers. And through it all long-time Pinnacle volunteer and trailblazer Roger Haydock was figuring out the best downhill route to display appealing views and features. He then both engineered and constructed trail solutions through the challenging, steep and wet sections. Of his trail solutions, most remarkable is, perhaps, his stone causeway through one perennially wet area. At the opening ceremony Sarah Waldo, WHPA Vice Chair, expressed the Pinnacle Association’s gratitude for the Radfords’ funding of the bridge and parking area, and their important gift of land that both provides access to the ridgeline from Brookline Road and parts west and adds 1.2 miles to the previous total of 25+ miles of trails the Pinnacle Association maintains from Putney Mountain to Grafton. She thanked former WHPA Chair Rick Cowan for shepherding the project from its inception to completion. She also recognized loyal volunteers and professionals who helped make the trail and its access a reality. Experienced trail workers Tony Coven, Joe Richards, John Foster, and Andrea Capron were essential in helping to create Haydock’s rugged new trail. Andy Toepfer was responsible for building and installing the new kiosk and its extensive map of the area. Gary Lavorgna fine-tuned the entrance and steps from the parking lot to the trailhead. In his remarks, Terry Radford shared his motivation for the land gift and the Radford-Smith Trail as both a testament to a shared love of nature and a memorial to Paul Smith, Terry Radford’s boyhood friend. With completion of the trail, Radford fulfilled the pledge he made to Paul Smith years ago to do something that would help birds. The land the Radfords gave to WHPA and the trail system they made possible help to protect bird habitat and enable hikers to see more of forest birds in their natural habitat. Then Roger Haydock, who chose the route for the trail, described the remarkable features of the beautiful landscape, the challenges presented by the steep terrain, and how he plotted and created the trail down the slope. 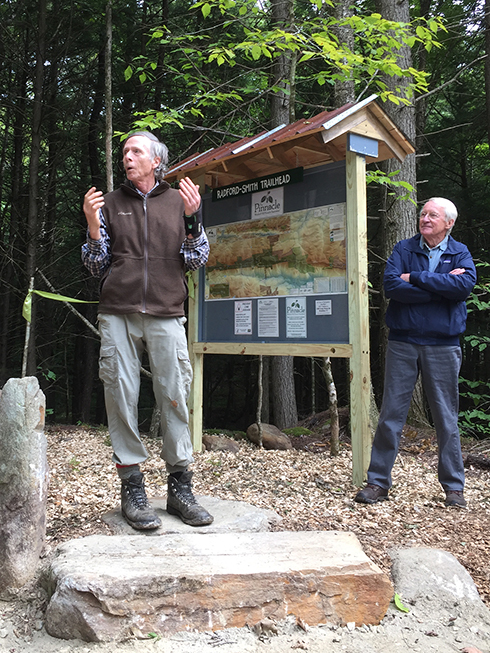 Roger Haydock explains how he chose the route down the hillside and engineered the trail while Terry Radford looks on. The Radford-Smith Trail embodies a generosity of time, talent, and treasure freely given by people who love the land and want to open up its power and beauty to others who can learn how to enjoy and care for it. 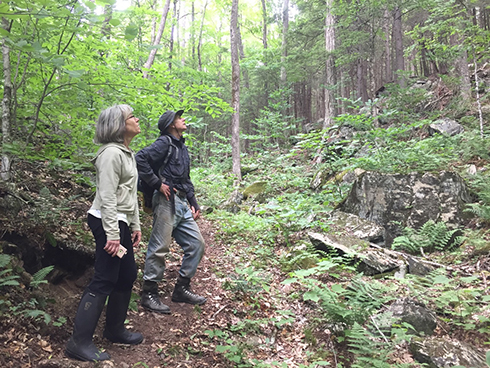 Sarah Waldo and Roger Haydock hike the trail and view some of the rocky terrain. Eager hikers await the ceremony to open the trail. 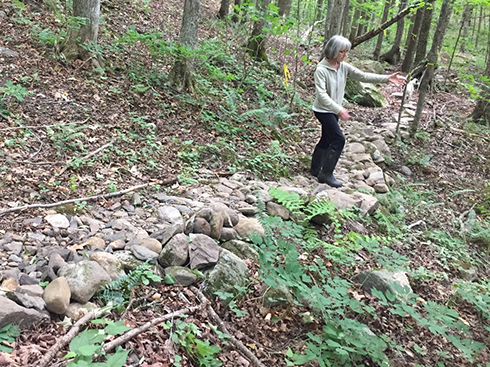 The Windmill Hill Pinnacle Association is grateful to the many individuals who participated in this project and looks forward to hearing from hikers about their experiences on the new trail and seeing photographs they might take of the land’s features and their hiking adventures. Stories and photos should be sent to sarah_waldo@hotmail.com. 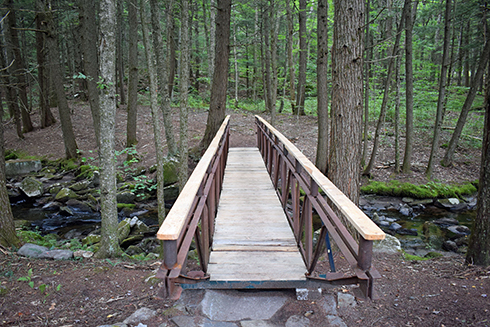 The new bridge across Grassy Brook, created by Phil Pellerin, awaits hikers. Sarah Waldo is impressed by Roger Haydock’s stone causeway. Edna Radford cuts the ribbon to open the new Radford-Smith Trail.